During April 14-16, members of the KWW (Alpine Club of Warsaw) put up three routes on the island of Uloya in the Norwegian Arctic, 500 kilometers north of the Arctic Circle. The islands Uloya and nearby Kagen contain walls up to 700 meters high. On April 14, after a two-hour approach on skis, Marcin Chmielinski, Tomasz Klimczak and Artur Paszczak reached the base of the north pillar of Uloytinden (1114m), in the Isvannet Lake cirque (595m). From camp, their route appeared straightforward, but once they got close, "[it] started looking quite serious and intimidating," Klimczak said. The wall was made up of verglas and snow-covered rock. The team struggled up the first two pitches, a snow-covered slab "with hopelessly loose ground and a very poor pro (M5 and M5+)," continued Klimczak. The route's ice was too thin for screws, so they placed cams, pitons and nuts where they could. 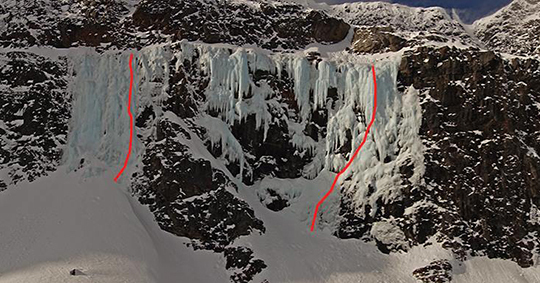 Above the first two pitches, they cut right to avoid the steep terrain directly overhead and reached another technical section. The next three pitches followed a diagonal ramp left. Here were the route's cruxes: M6-, M6 and M6+. 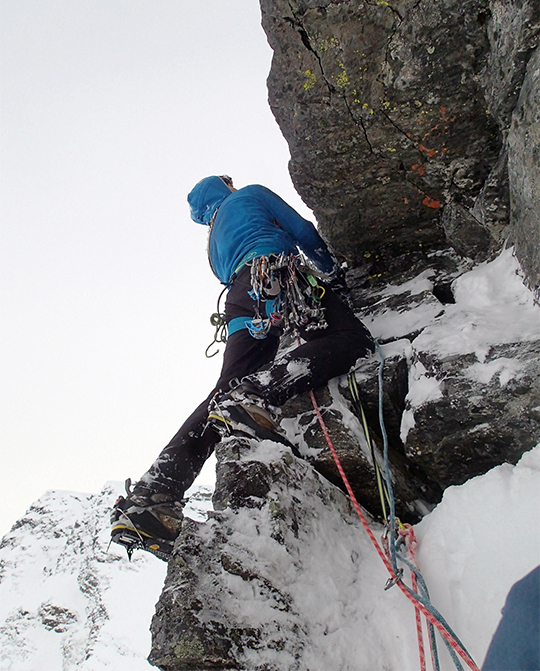 Above these mixed pitches, the three simulclimbed for another 250 meters, including three long, easy snow pitches with some sections of rock to reach the headwall. 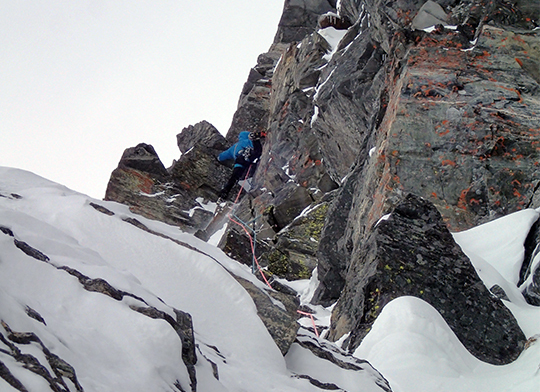 After two long pitches they arrived at a 20-meter overhanging summit cornice. "In the last daylight, we finished our route about 10 meters below the overhanging snow that was completely impossible to climb," Klimczak said. "[The cornice was] cantilevering about 15-20 meters in that spot." From their highpoint 10 meters shy of the top, the team made six rappels to climber's left of their route. They fixed pitons at their anchors, and down climbed steep snow to reach the ground. The 550-meter route, a mixed line with short sections of poor-quality ice, took 16 hours camp to camp. Though the climb wanders, "We did what we could given the circumstances...it [was a] proper mountain adventure," Klimczak said. Starless Spur is the first mixed route reported on Uloya. On April 14, 2015, Pawel Karczmarczyk and his client Witek Dabrowski established the first recorded ice climb on the island, a central line, on an icefall above Isvannet Lake. This year, on March 27, Karczmarczyk, again partnered with Dabrowski, established a 110-meter WI4+/5 and a 110-meter WI5+. "I don't think there was any climbing activities on Uloya before that, but I can't guarantee [it]," Karczmarczyk said. Artur Paszczak concurs: "We made extensive research with the local climbers and [we] are pretty sure that there was nothing done here [before last year]." 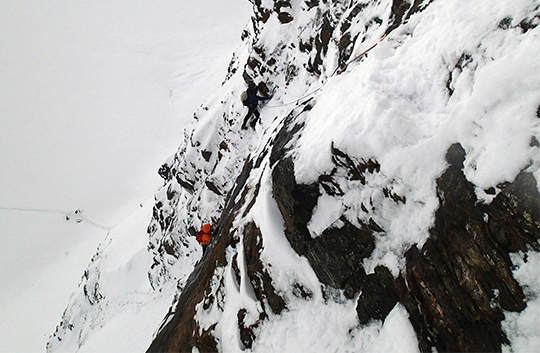 On April 16, Maks Kulesza and Piotr Wolski climbed a new line on the north face of Skjelettinden (952m), naming their 400-meter M5+ route The Three Max. The team encountered difficult conditions and poor options for protection. "Yes, the rock is loose in places but the difficulties are quite moderate," Wolski said. Their ascent took 14 hours round-trip. The climb's name "relates to a tradition of under grading the routes in the Tatras in the '70s and '80s. IUAA III+ was often as hard as VII,"Artur Paszczak said. The Three Max also has a double meaning. "My nickname is Trojka (The Three) and Max is short for my partner's name," Wolski added. On the same day Kulesza and Wolski climbed their route, Marta Szycman and Ewa Warzywoda climbed another route on Skjelettinden. The Skjelettinden Ridge (III, 400m) took them three hours. 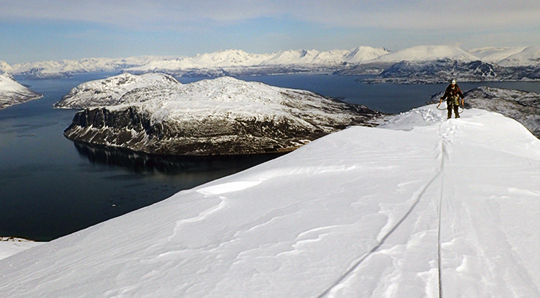 Between climbs, all three teams stayed in furnished apartments at the Lyngen Outdoor Center Uloya. "Last year, I took a tour around the lake and found out that the walls are quite serious, although from the distance they seem pretty lame—a very strange phenomenon," Artur Paszczak, owner of Lyngen Outdoor Center Uloya, said. "The pillars are steep to overhanging and the couloirs look very exciting. There are many other very interesting walls... more pillars, and [the] serious looking northeast face of Blatinden." Blatinden (1142m ) is the highest peak on the island. The peak's face northeast face is 350 meters tall. Earlier this year Paszczak scouted a wall on the nearby island of Kagen. "[It] looks like a combination of Troll Wall [and] Nalumasortoq, only somewhat smaller, ca. 400 to 500 meters, we guess." To learn more about climbing ice in Norway, visit northnorwayice.blogspot.no.